Does a Baby Make Things Right? There is no such thing as an ugly baby. Granted, some infants are cuter than others. But let's face it: every one of us have gone through an "awkward" phase. Some of us do so earlier than others. 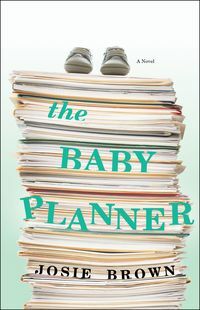 No matter how cranky or colicy, babies are all the more beautiful to Katie Johnson, the heroine of my latest novel, THE BABY PLANNER, because she wants one so badly. Unfortunately her husband, Alex, has many excuses as to why they shouldn't have one. Besides the fact that he thinks they can't afford one until his next bonus check, he is also upset that his first wife has moved out of the country and won't allow him to share visitation rights with his ten-year-old son. Katie gets her baby fix by channeling her energies into a new business: baby planning, in which she helps new moms weed through all their pre-and post-natal childcare fears, as well as all the baby gear that they are told they should have at their fingertips. Throughout the book, Katie comes to sympathize with her clients: not just because they feel overwhelmed with too much information and too little time, but because they want their babies as desperately as she does--and, like her, not necessarily for all the right reasons. At least one of the characters in the books feels that a baby will save her marriage. Another is concerned about the negative effect it will have on her relationship. In truth, the issues that come between a woman and a man are sometimes greater than the joy they may share by having a child. Also, if one person in a relationship wants a child but the other doesn't, the issue can in fact pull a marriage apart. What are your thoughts on this? Feel free to comment below. All who do will be entered in a giveaway for a signed copy of THE BABY PLANNER. Also feel free to read and excerpt of the book here. After doing so, enter my contest for the prize of a $100 gift card to your favorite bookstore. Don't forget to check back here for a special BABY SHOWER to celebrate the release! The giveaway is from the author, this one is limited to the US and she is picking the winner! I think it has to be a mutual decision. Kids are so much work. I don't think it would be fair to make that decision alone. A baby doesn't solve problems in a bad marriage. The decision has to be mutual. having a baby in a bad marriage will only make things worse. I sure agree that both parties need to agree on starting a family. Or adding a second baby to the mix, which in some cases can be as polarizing as deciding to start a family at all. Having children is a decision for both parents but I think this should be discussed to some extint before marriage. I don't think that having a baby can fix a marriage, either a marriage is going to make it or it's not. Although I can relate to Katie's character wanting a baby. I wanted a baby very badly, but thought I couldn't have children after trying for 9 years. So I finally gave up, and thought I wasn't meant to have children. Two months later I found out I was going to have a baby. We call her our miracle baby, because we only had the one. Love to read this book. I think making the choice to have a child has to be a mutual decision. If you mess up raising your children, I don't think whatever else you do well will matter. Babies deserve parents who want them!! It really should be discussed before the wedding. I think the issue of starting a family really MUST be discussed before marriage. But sometimes people change their minds. If that is the case, then I think the couple needs to part ways otherwise there will always be resentment. A child deserves caregivers that really want him/her. Not really, sometimes it just makes things worse bc a relationship is hard and a baby changes things, hopefully for the best, bc babies are wonderful!! Bt if a relationship is broken, then having one more tie, just makes it too tight and it might burst. A baby is just one of the most joys one can have and a retionship should stand on its own- baby or not. As anyone who has had children knows, they make a big difference in a marriage. Your time for yourself and as a couple is no longer your own. Those who think a child will save a marriage or bring a couple closer together had better think again. It must be a decision made by both of you and shouldn't be taken lightly. The time and stress of children will test your relationship. At the same time, if you have a strong relationship, the joys and rewards of having children can not be matched. Having kids is a big deal. Just having kids stresses a marriage. I can't imagine what it would be like if one of the parents felt resentful about the child. Ideally, whether to have children should be discussed and agreed upon before a couple marries. As others have said, a baby will not solve any problems in a marriage and could create new problems. Having a baby doesn`t solve problems. Would love to read this, sounds interesting. As one half of a young married couple trying to decide when to start our family, this book sounds exactly like what I should be reading! Cute! Having a baby won't save a doomed marriage. It'll just make things more difficult. That's not fair for a child to be brought into a bad situation.